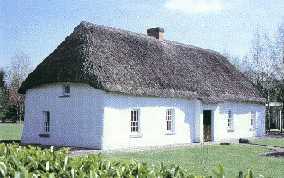 Edmund Rice was born on a farm outside the small town of Callan, Ireland, in 1762. Because Callan was Irish-speaking, he was undoubtedly called Eamann at home. The Rices were comfortable by the standards of the day. Edmund became a successful businessman in Waterford, in spite of the restrictive Penal laws. While he was going about his business he became aware of the ragged, disorderly, uncared-for boys who daily gathered around the timber stacks on the docks. He began to feed them, to provide them with clothing, and to teach them about their faith and academic subjects. Unfortunately, however, doing the work of God can be addictive. The more you do, the more you want to do. Edmund decided to sell his business and spend all of his money and all of his time working for God by working for the poor; taking literally the words of Christ: "Go, sell what you have, give it to the poor, and come follow me." Edmund became famous in Waterford and others joined him. He founded the Congregation of Christian Brothers, taking the religious name Ignatius, after the founder of the Jesuits. Today, Christian Brothers throughout the world continue the work which Edmund started during the time of the Penal Laws in 18th. century Ireland.